Well, after more than a good deal of pondering, I have finally decided to go for a build. Can't help myself though, it's going to have to be an Alfa V6 power plant. Last edited by ChrisS on 14 Sep 2018, 00:35, edited 1 time in total. You have no idea! It shouldn't be too bad though. At its deepest point, across the cams, it's 2" more than the book engine space, no wider and probably no taller than a stacked 4 pot. The donor car I have in mind came with the V6, a 4 pot twin cam or a 5 pot diesel. They all seem to fill the engine bay about the same. Gearbox is 6 speed cable shift and I have already fitted one of those into a mid engine layout so have some solutions for that. Engine and transmission is roughly 200kg I think. Up there, but not utterly mad. The Stratos copy I built started life with a Lancia Twin Cam 4 pot motor but I pretty soon fitted an Alfa V6. Certainly noticed the difference in the weight and balance but nothing too bad. I won't be using this for anything other than road use, so ultimate performance isn't the goal. A light 4 pot forced induction motor would be better for that of course. A 1.8 VAG unit would be good, but a decent one would cost a heck of a lot more than I intend paying for the Alfa option. And an Alfa V6 sounds, well, awesome. A lack of funds and previous experience of mission creep and budget busting mean I am approaching this in an entirely new way for me, everything will be about saving money where I possibly can. Engine will remain stock, I will use the OEM management, might even use the instruments out of the Alfa engine donor if I can make them look OK in some way. I am also going to avoid my usual trick of doing a totally gratuitous engine rebuild like I normally do. I will drive the donor and make sure all is basically OK then other than obvious service items, leave it well alone. Yay, first part purchased specifically for the build has just arrived. An Elise fuel tank. Works out to a bit over 10 gallons (imperial ones ) or 46.4l if you prefer. A very tidy stainless steel item for less than the price of filling it up twice (UK prices). The two internal baffles I can see for sure are placed roughly 1/4 tank width from each end, there's a large hole in the baffle toward the top for filling, and right on the bottom of the tank, a roughly 1/4" ID pipe that runs from one side to the other for fuel balancing. Also some evidence of spot welds suggesting other 'stuff' inside there that I can't actually see. Very pleased with it. I wonder how my chances are of fitting the Alfa 166 fuel pump/level sender assembly into the hole in the top......itching to get hold of the donor car now. It's not a bad car on the whole, almost too nice to break...but only almost. It'll provide loads of parts to keep my other 166 on the road for a while longer, plus a bunch of stuff for the Midlana. I'm looking at potentially making use of the instruments and switchgear from this car. Main issue with that would be having to retain the ABS system, or at least generate a road speed pulse. Generating a pulse is going to be easier by far. It also has various three letter abbreviations that are supposed to aid stability & safety - VDC, vehicle dynamic control, ASR, automatic stability regulation but these rely on having the ABS as well and I strongly suspect they would be somewhat confused by me putting the power unit in the back, let alone the wildly different dynamics of the two vehicles. Probably best avoid that idea I think. Pretty happy with it as a donor for my budget build. Must remember to take lots of pictures when I take it apart. Be sure to weigh the drivetrain, preferably including a picture of it so we all have an idea of what's included in the weight. Midlana1 wrote: Be sure to weigh the drivetrain, preferably including a picture of it so we all have an idea of what's included in the weight. Will do Kurt. This particular car & engine didn't make it over to you chaps, but the earlier 24V did in the late model 164. I intend stripping off the A/C compressor and PS pump - no need for either, and removing those means it's really easy to 'belt up' the reduced path with a short belt and no tensioners or idlers, so that saves an ounce or two. This is a tried and tested mod, which is always nice. Had real problems getting a reliable belt run with the supercharged engine last time. Got there in the end, but it was a bit of a pain. This model has the 'Euro2' standard emissions control, which means just one CAT, 2 lambda probes and some not half bad tubular headers. The later Euro3 engine has 3 CATs, 2 of them in the headers, which makes them more bulky, heavier and slightly worse for flow and 3 probes. Seems like a win-win to me. It's also worth weighing the driveshafts while you have a chance, as Kurt says, engine to the hubs is an apples to apples comparison for front mount / rear drive numbers (that often don't include propshaft or diff ). I've only ever heard an alfa 6 on full song on youtube, but it certainly is a very nice thing, looking forward to seeing how it all comes together! Can do. The setup does have an intermediate shaft so AFAIK, both sides are the same. Some models show as having 2 the same in the parts catalogue. freakynami wrote: It's also worth weighing the driveshafts while you have a chance, as Kurt says, engine to the hubs is an apples to apples comparison for front mount / rear drive numbers (that often don't include propshaft or diff ). Was mooching round the interweb the other day and came across this.. While the design is clearly a matter for ones personal tastes(! ), I found it interesting/amusing to see they had used parts from an Alfa 166 to provide many of the instruments/switches etc, which is what I hope to do with my Midlana. 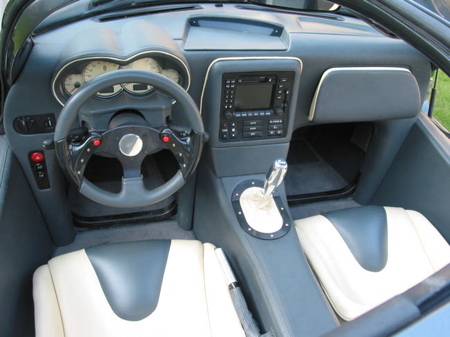 Don't worry though - there won't be any leather trim in mine, nor the large central display/control panel. (Although I have to confess that I did very briefly consider using it - I got over it though).